The Michigan State Teacher of the Year Network is comprised of state Teachers of the Year and finalists for the award who seek to influence education policy decisions at the federal, state and local levels. The MI-STOY Network will also welcome their newest member, Laura Chang, a second grade teacher from Vicksburg. 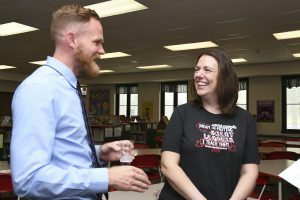 Laura will serve as the Michigan Teacher of the Year 2019. Laura brings 18 years of teaching experience from early elementary to the college level to the distinguished group of teacher leaders. The MI-STOY Network initially met in January 2017 with late State Superintendent Brian Whiston. “The message from Brian to the Teachers of the Year was, ‘We need you. You are welcome here. We value your opinion and expertise.’ He wanted the TOYs to inform the policy conversation that happens at the state level,” says Matinga Ragatz, MTOY 2011 from Grand Ledge. I was Teacher of the Year in Livonia 1983. Would that qualify to join the group or is it just at the State level?